At the end of the day, you want to rewind with your favorite playlist. The audiophile in you is aching to hear the music for all it’s worth without the distraction of ambient noise cluttering your sound waves. When you want to block out the world and get lost in what you’re hearing, Comply™ Foam’s Isolation 200 tips is your answer. 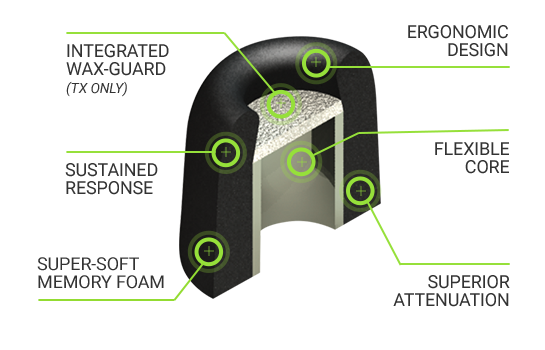 Through years of research and innovation, Comply™ Foam has perfected the listening experience. The result is a patented viscoelastic memory foam noise isolating earphone tip replacement perfect for drowning out the world around you and immersing you in the music you love. Tailored Fit for Every Ear Canal: Ear canals come in an endless variety of shapes and sizes. What’s more is that your own ear canals change as you open and close your jaw, raise your body temp, and hydrate. Because of these seemingly constant changes, it simply doesn’t make sense to settle with standard earphones that don’t conform to your specific ear canal. A one-size-fits-all standard has been filling the market for too long, and you’ve been paying the price at a cost of diminished sound quality. A Perfect Seal: Comply’s memory foam earphone tip replacement gets the most out of your earphones. Each earbud is body heat-activated—when you plug it in, it expands to fit every nook and cranny your ear canal may have. This tight seal provides you with total sound isolation and a decibel reduction 2x that of standard silicone eartips thanks to being nearly 10x thicker than silicone. This means you don’t have to turn the volume up to 11 to hear crystal clear sound as you can finally start hearing high-quality sound at lower volumes since there’s no noise to drown out anymore. Superior Comfort for Long Listening Sessions: Isolation Tx-200 and T-200 earbuds are 30x softer than silicone rubber. The comfort of memory foam earbud tips will have you wondering why silicone rubber is a standard in the earphone industry. A flexible core combined with superior attenuation and our super-soft memory foam creates the perfect storm for long listening sessions with no fatigue or achy ears to follow. Enhanced Audio: The ergonomic design perfectly funnels pure sound directly into your ear, where it belongs. Whether you’re a total audiophile or an everyday listener, you’ll begin hearing music like you never have before as all parts of the music make their way to your ear instead of getting lost in the outside noise. WaxGuard™ Protection Like No Other: When you invest in a pair of Isolation Tx-200 Series earbud tips, you’ll get the bonus of Comply’s innovative WaxGuard™ Protection. This acoustically transparent filter doesn’t cloud sound as it keeps earwax and other debris from your earphone’s soundport. While recommended for high-end earphones, WaxGuard™ can help prolong the life and music clarity of any earbud as sensitive soundports stay squeaky clean longer.